Patellar (kneecap) instability results from one or more dislocations or partial dislocations (subluxations). Patella is the small piece of bone in front of the knee that slides up and down the femoral groove (groove in the femur bone) during bending and stretching movements. The ligaments on the inner and outer sides of patella hold it in the femoral groove and avoid dislocation of patella from the groove. Any damage to these ligaments may cause the patella to slip out of the groove either partially (subluxation) or completely (dislocation). This misalignment can damage the underlying soft structures such as muscles and ligaments that hold the kneecap in place. Once damaged, these soft structures are unable to keep the patella (kneecap) in position. Repeated subluxation or dislocation makes the patella unstable and the condition is called as patellar instability. Abnormal “Q” angle: The “Q” angle is a medical term used to describe the angle between the hips and knees. The higher the “Q” angle, such as in patients with Knock Knees, the more the quadriceps pull on the patella outwards causing displacement. Patella alta or “high knee-cap”: A higher than normal knee-cap position leads to lack of articulation with the knee-cap groove and higher likelihood of popping out. 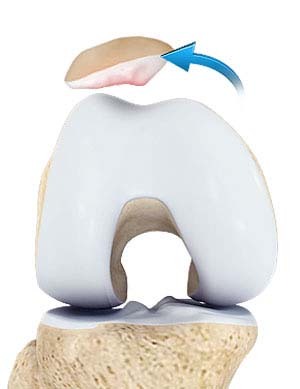 Trochlear dysplasia or “shallow groove”: The kneecap relies on the walls of the groove to provide stability, Without deep walls, the knee-cap is more likely to dislocate. Dr. Patel diagnoses the condition by collecting your medical history and physical findings. He may also order certain tests such as X-rays, MRI or CT scans to confirm the diagnosis. Treatment for instability depends on the severity of condition and based on the diagnostic reports. Initially Dr. Patel may recommend conservative treatments such as physical therapy, use of braces and orthotics. Pain relieving medications may be prescribed for symptomatic relief. However, when these conservative treatments yield unsatisfactory response surgical correction may be recommended. Considering the type and severity of injury surgeon decides on the surgical correction. Dr. Patel may perform a procedure to realign the quadriceps mechanism by tightening the tendons on the inside or medial side of the knee. This can be a medial retinacular imbrication or a MPFL (medial patellofemoral ligament) reconstruction. If the there is bony malalignment a tibial tubercle transfer (TTT) or tibial tubercle osteotomy (TTO) may be performed. This procedure involves the surgeon cutting a section of bone where the patellar tendon attaches on the tibia. The bony section is then shifted and properly realigned with the patella and reattached to the tibia with two screws. Following the surgery, a rehabilitation program may be recommended for better outcome and quicker recovery.